The Canon Lens: What’s in a name? Each Canon lens name is made up of a bunch of numbers and letters. At first glance, it may not make much sense. But once you know the formula, you’ll find the names to be quite useful. EF lenses can be used with all EOS digital SLRs. 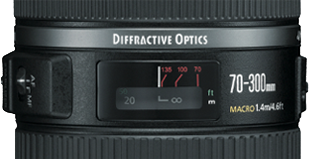 If you see EF-S, this means it is a lens that is used only on EOS digital SLRs with an APS-C size sensor. This refers to the focal length or field of view. A small focal length = a wider angle, a higher focal length = telephoto angle. A focal length shorter than 50mm is considered a wide angle lens. A focal length longer than 50mm is a telephoto lens. A range of numbers, like the example above, lets you zoom between telephoto and wide angles. This speaks to the aperture range. The larger the aperture, the lower the f-number. The smaller the aperture, the higher the f-number. The lens above has a maximum aperture of f/4.5 at 70mm and f/5.6 at 300mm. A higher end zoom lens has the same maximum aperture throughout its focal range. 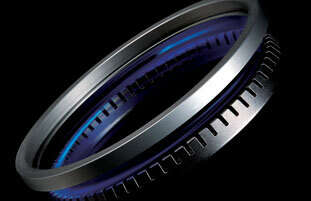 Aperture refers to the amount of light that gets into the camera. A larger aperture means a lot of light will be let in. A smaller aperture means less light is let in. Larger aperture (smaller f-stop) will decrease depth of field. Smaller aperture (larger f-stop) will increase depth of field. Large depth of field = a photograph that is mostly in focus. Shallow depth of field = more of the background is blurry or appears to have melted. The “L” series of Canon lenses are highly coveted by professional photographers for their performance. They are easily identifiable by the red ring around the lens barrel. IS stands for Image Stabilizer. This feature helps you capture sharp photos, even at lower shutter speeds. This innovative technology looks out for shakiness and then adjusts to compensate for it. This is a Diffractive Optic lens. The specialized design of this lens makes it smaller and lighter than other lenses that have a similar focal length and conventional glass optical elements. 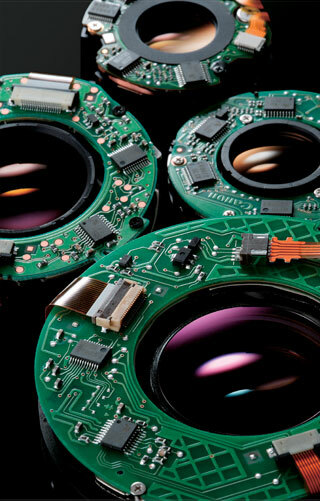 A lens with an Ultrasonic Motor drive has a fast, silent and precise autofocus function. This lens also helps conserve battery life by using less power.